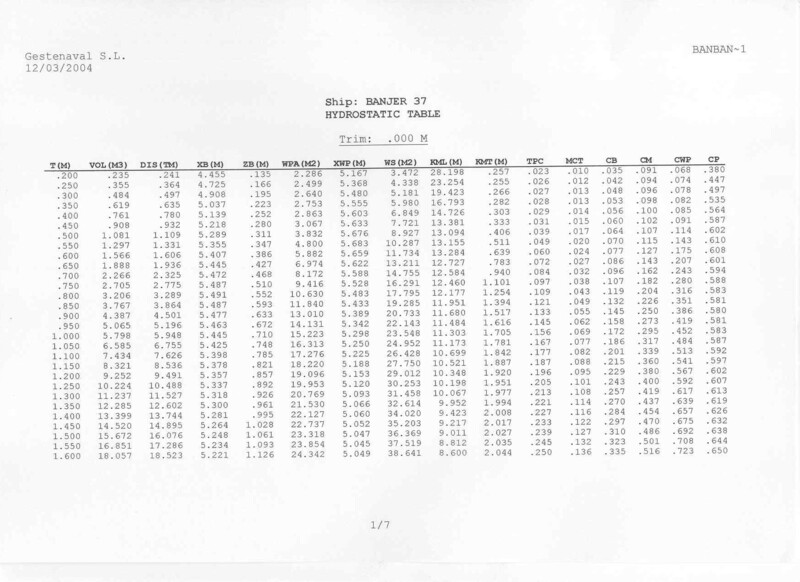 - These hydrostatic data have been obtained by digitalizing Banjer's lines from not greatly accurate copies of Lines Plans and processing them trhough the program of naval Architecture DFHYDRO. - Draught (T) is measured from the bottom of the keel, astern. 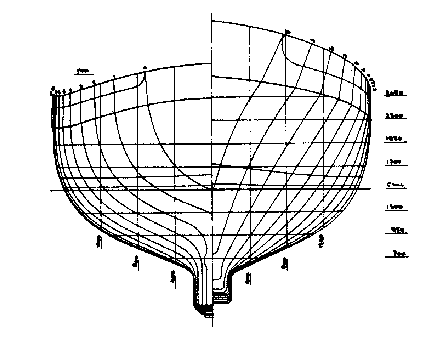 - Longitudinal measurements origin is at the rear end of hull. - Calculated data is for a 0.00 meters trim. Data are also available for other trims, so you may ask Guillermo for them. In accordance with these hydrostatics, Banjers seem to be more heavy than spec. For a 1.4 m draught, they seem to weigh 13.74 metric tons (tonnes) or 13.53 long tons. If they weigh really 12 tonnes, then draught should be more in the proximity of 1.32 m.
We'd like to carefully analize this apparent contradiction with Banjer's original data. All collaborations , by means of other known info, data measured aboard, etc., will be most welcome. 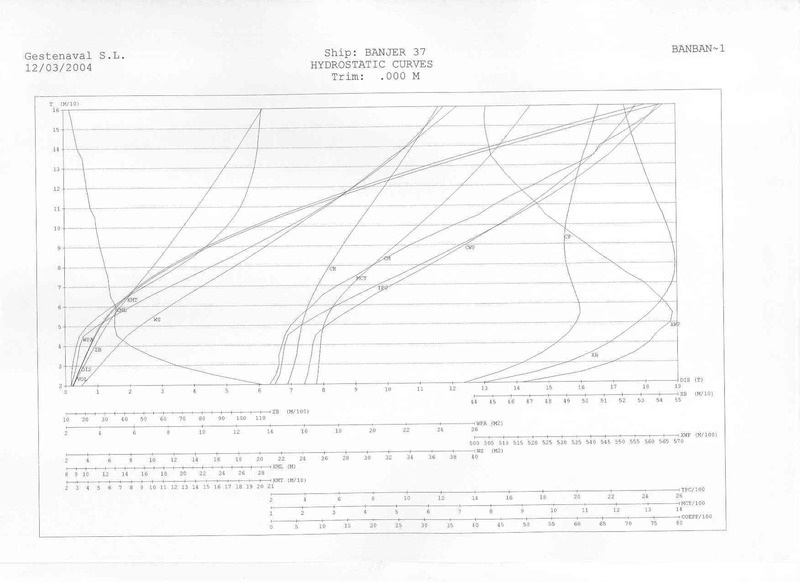 If any of you perform an inclining test for his Banjer and provide me with the obtained data, I will be most glad to make the stability calculations for you and give you back the Center of Gravity position and GZ curves (Levering arms) for both light ship and full load conditions (Based on hydrostatic data in this page). - Either completely empty or full all tanks. - Preferably remove all (And this means all!) cargo from aboard, or then carefully note weights and their positions (3 axis: longitudinal, vertical and lateral). - Measure freeboards from deck at bow and stern tips up to half centimeter, at least. Milimeters should be great. Measure from outside the boat, as your weight would influence on measurements. Be careful to accurately discount gunwhales and/or deck gear height, to fit measurements to deck level. - In calm waters, with no wind and loosen warps, move a couple of known weights from side to side located amidships at the corridors (about 100 kgrs each should be enough for light ship condition. Try first, to obtain a heel angle between 1.5º and 2º). Measure carefully the weights, their center of gravity height over deck and longitudinal position, the transverse translation distance among their c.g's., and the heel angles obtained with a digital clinometer or a pendulum (moving weights both sides). Mark and note first the "zero" with one weight on each side (Boat should be level or with a neglectable heel). - Send me all data. Displacement; metric Tons (1 Tonne = 1000 kg). Longitudinal position of Center of Buoyancy; meters. Water Plane Area; square meters. Longitudinal position of waterplane geometry center; meters. Heigth of longitudinal metacenter; meters. Height of transverse metacenter; meters. Main transverse section coefficient; adimensional.